There’s a storm going on now, its casting shadow amongst the corners of the room and unwillingly holding everything black until those momentary flashes of white light pierce through the darkness. Though, those are few and far between and vanish just as fast as they arrived, like all good things. I’ve always thought that storms were rather bold, half poison and half god. The kind of boldness that declares, “I’ll take control of your universeand give it back when I’m ready”. It might be kind of strange to personify a storm, but hey, I like it. With windows wide open to the elements, there’s an influx of both lung and heart that happens. It’s the sudden onrush of fresh air, of nature, earth and water. You can feel the cleanse, of washing away what’s impure only to regenerate something even more beautiful. I feel the same way when I travel too, you board a plane and return an infinitely more complex and rich being than when you left. 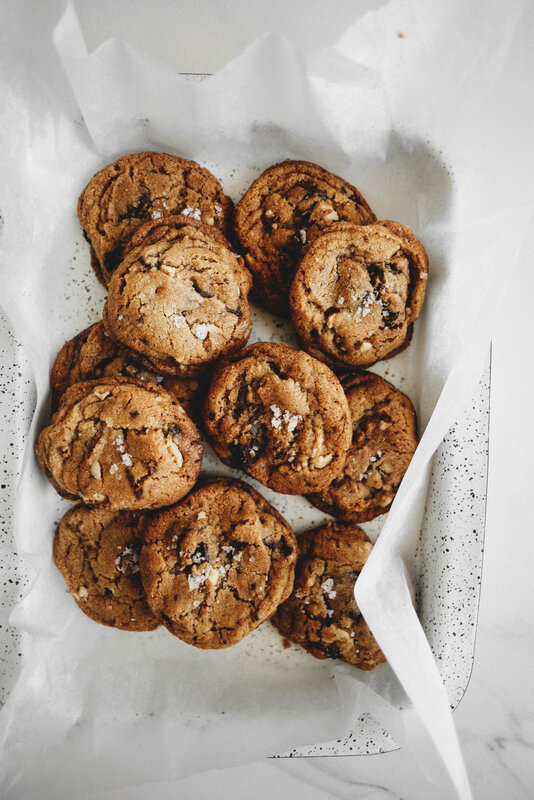 The inspiration for these cookies came from the byCHLOE bakery in New York City, where there was chocolate chip walnut cookie like no other, better than any cookie ever tasted. I might be projecting my time in New York onto the cookie (projecting and compartmentalising is something I’ll forever do), slightly - but it was still pretty good and something I had to recreate once I returned home. It was vegan too, and served as a gentle reminder that embracing alternative baking and a predominately plant based diet could be equally as delicious, and far more kind. More than anything in this world, I loathe being labelled. Being confined to a socially acceptable definition is something I’ve never been good at. I’ve always fallen outside the lines. For too long, both body and mind existed in a chaotic and savage pariah, indulging in everything and nothing, fleeting addictions and always with - a ghastly yearning for something more. The truth is, it was the only way I knew how to live. And it wasn’t medicine, more like a drug. A drug that promises to save but keep swallowing and you’ll soon find it destroys far more than it gives. So, I won’t label what I am or the foods that I choose to eat. But, what I will say, is that I’ve come to enjoy vegan baking. It’s creative, difficult - and I like the challenge. These Vegan Chocolate Chip Walnut Cookies are a revelation in my baking life. I couldn’t see myself going back to an all-butter and egg chocolate chip cookie after them. The taste is more complex, more cookie-ish (is that even possible?). They’re kind of fantastic - soft, slightly chewy and oozing with melted chocolate in the centre. I’m desperately going to try and make a cookie cake with them, like the ones in the past archives of the blog for my upcoming birthday (21!). It’s the perfect recipe for my growing alternative baking arsenal. In a large sized mixing bowl, whisk together the flour, baking powder, soda, espresso and salt. Set aside. In a separate large mixing bowl, whisk the oil, sugars and water together until it’s smooth and well incorporated. Whisk in the vanilla bean extract. Fold the dry flour ingredients into the bowl with the liquid mixture until it’s just incorporated. Add in the chopped dark chocolate and walnuts. Mix until they are evenly distributed throughout the mixture and no flour is visible. Cover the bowl with plastic wrap and place it in the refrigerator to chill for 24 hours. It may be tempting to skip this step, but don’t! The resting time allows for the dough to set and infuse the flavours - making for an infinitely better textured and tasting cookie. When you are ready to bake the cookies, pre-heat the oven to 180 C (350 F). Line two large cookie sheets with parchment paper. Remove the dough from the refrigerator and use a 5cm (2") cookie scoop or tablespoon as a measure to scoop out about 18-20 cookie dough balls, sprinkle the tops with a bit of the flaked salt. Divide the dough balls between the cookie sheets. 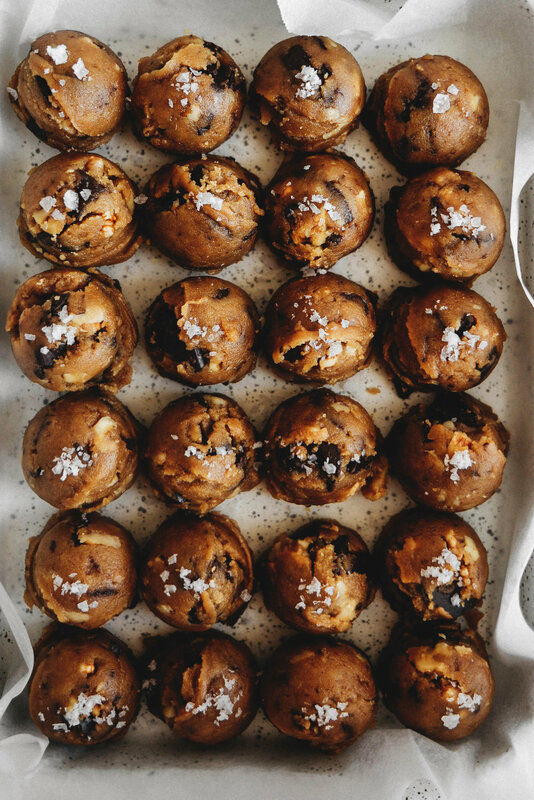 Depending on the size of your sheets, you may need to bake the cookies in three to four batches, store the cookie dough balls that are waiting to be baked in the refrigerator. Bake, for 11 to 13 minutes, or until the edges are firm and just beginning the turn golden. Remove from the oven and let the cookies cool and harden slightly before serving, about 15 minutes.